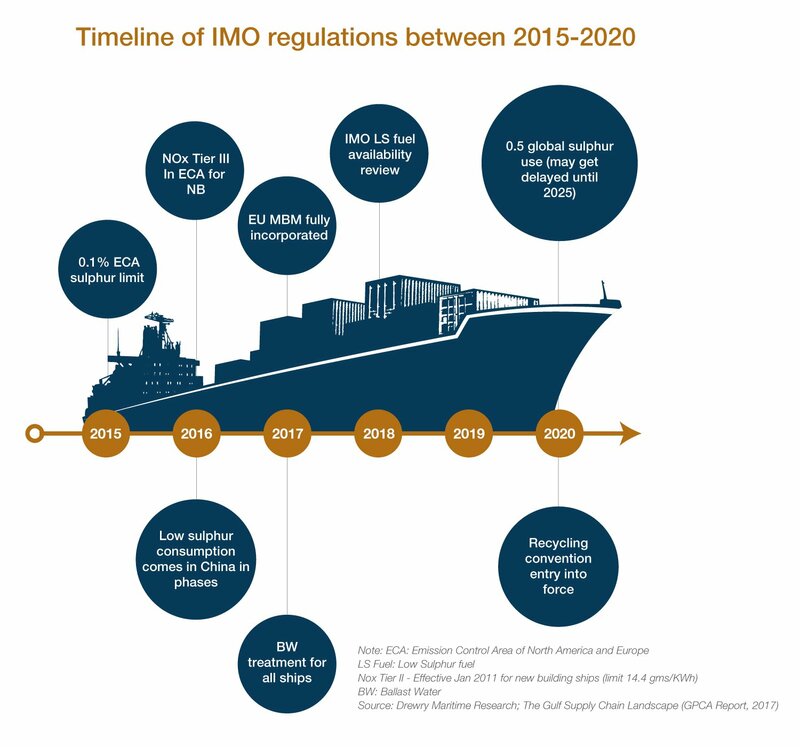 With no delays expected for the implementation of the new International Maritime Organization (IMO) bunker fuel regulation, from 1 January 2020, shipowners will be required to meet the 0.5% global sulfur cap on fuel content, vs. the present limit of 3.5%. The new regulation is expected to dramatically alter the global supply chain landscape, leading to serious implications for the entire oil value chain, particularly on the refining and petrochemical side. Compliance with the new fuel specification will involve significant costs for the refining and shipping industries, while petrochemical producers could face higher freight rates and changes in feedstock pricing. In order to comply with the regulations, shipowners would need to adopt one or a combination of solutions. One of the compliance routes is to switch to low sulfur fuel with 0.5% sulfur content or below. This would involve minor capital expenditure to ensure the segregation of fuels. However, it would be the costlier option, as compliant fuels are expected to price at a premium to High Sulfur Fuel Oil (HSFO). It would also inevitably result in higher demand for low-sulfur fuels and a surplus of high-sulfur residue. According to some estimates, more than 2 million b/d of High Sulfur Fuel Oil (HSFO) will be displaced from the bunker sector as bunkering (in addition to power generation) is a key demand sector for Fuel Oil. The FO displaced from the GCC region may potentially flow to Saudi Arabia, where demand for FO in power generation is increasing in order to replace direct crude burning in power generation, particularly in peak months. In the Arabian Gulf, UAE’s national oil company, ADNOC, is already preparing for the IMO 2020 sulfur regulation, with the announcement of a new project in Q3, 2018 as part of its 800,000-b/d Ruwais refining complex. The Carbon Black and Delayed Coker Project will enable the company to produce zero sulfur content bunker fuels by 2020 in compliance with the new IMO sulfur fuel regulation. A second option would be to install on-board exhaust gas cleaning systems, known as scrubbers, to remove emissions from the ship exhaust. This would allow for the continued use of HSFO with 3.5% sulfur content or above, but it could lead to increased fuel consumption and CO2 emissions. For ships planning to retrofit scrubbers, a GPCA report estimates that capex of USD 0.5 million to USD 1 million will be incurred depending on the size of the vessels. With large ships accounting for most bunker fuel demand, consultancy firm IHS Markit estimates that scrubbers will be the preferred solution for much of the current fleet due to a payback period of one or two years provided by the lower-cost high-sulfur bunker. 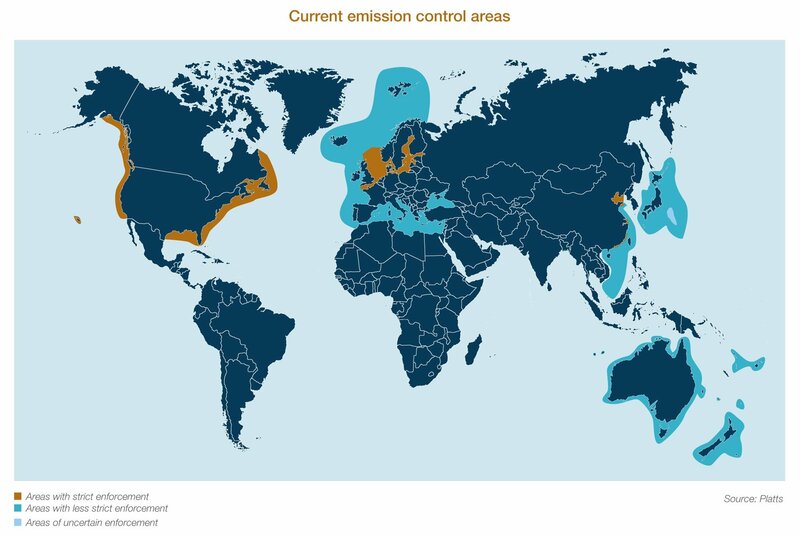 Currently, IHS says, less than 500 vessels have installed or ordered scrubbers as there is no economic incentive until 2020 and uncertainty about enforcement and compliance remains. 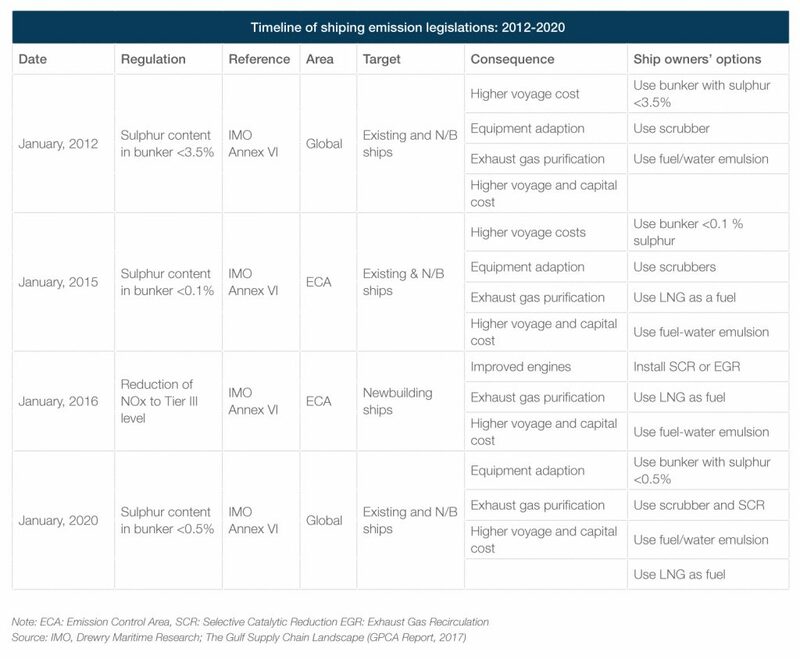 A combination of all three compliance routes will result in higher costs for the shipping industry and significant capex requirements. This would be reflected in freight costs post-2020. 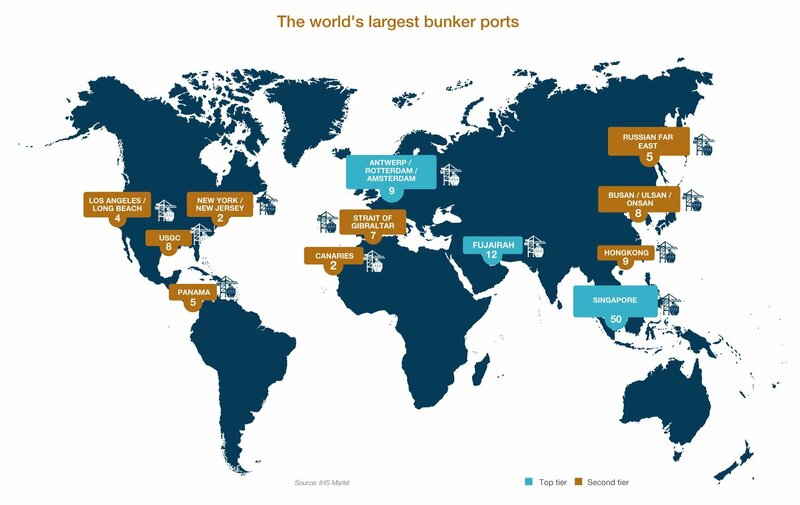 By some estimates, shipping costs could rise by up to USD 60 billion annually from 2020 onward, with bunker costs taking up 70-80% of total voyage expenses in a full compliance scenario. A separate analysis estimates that at 100% adoption, switching to marine gas oil (MGO) would see freight rates go up by around USD 1 a barrel. 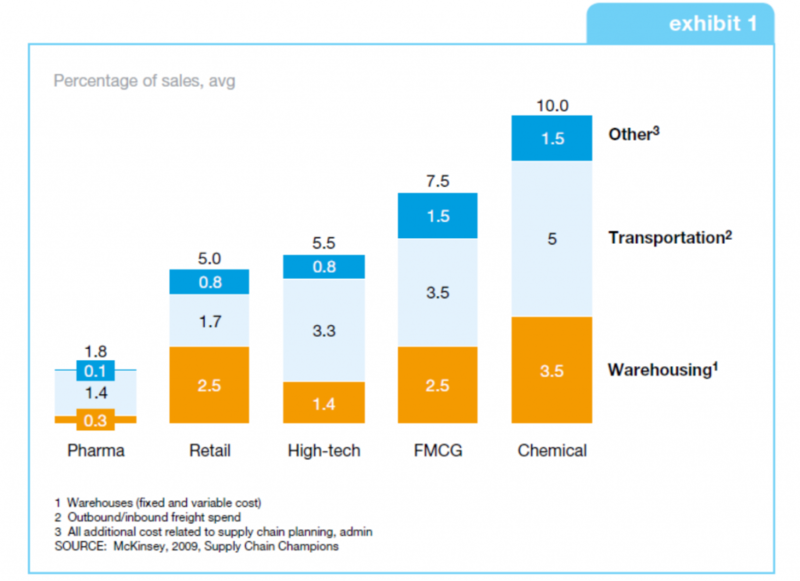 Subsequently, higher freight rates will influence relative differentials on both the feedstock and product sides of the supply chain, but the effect will vary depending on the dynamics present in each value chain and market. When will the impact be felt? We can expect high global adoption rates in 2020, equivalent to 85% of residual bunker demand. What remains uncertain is the enforcement framework, as inspection of ships at high seas is simply not practical. It will fall on the IMO member states to implement the new legislation individually. Flag states (where the ship is registered) have jurisdiction over violations in international waters, while port states can only fine vessels breaching IMO rules in their territorial waters. The IMO will also require ships taking on fuel oil for use on board to obtain a bunker delivery note, which states the sulfur content of the fuel oil supplied. Samples may be taken for verification and ships must be issued with an International Air Pollution Prevention (IAPP) certificate by their flag state. Port and coastal states can use port state control to verify that the ship is compliant. They could also use surveillance, for example air surveillance, to assess smoke plumes, and other techniques to identify potential violations. Located on the east coast of the UAE, the Port of Fujairah is the world’s second largest bunkering hub after Singapore and occupies a highly strategic location that connects key trading routes between Asia and Europe. It is also one of the busiest hubs globally, with around 14,000 vessels received at the anchorage and over 4,300 vessels handled in the port. Fujairah will be directed impacted by the new IMO regulations, with some analysts predicting it could benefit significantly from the expected changes and even grow its market share. Firstly, the port is equipped with one of the world’s most advanced fuel blending operations that could enable it to meet potentially growing demand for low-sulfur products. Secondly, the company is working on a number of infrastructure alterations, which will be implemented before 1 January 2020, to meet the expected changes in regulations. The modifications are designed to guarantee a high level of service without weakening the existing port’s ship berthing flexibility. Longer ship waiting times can be expected once the new regulations come into force due to the uncertainty and lack of preparation by some ports to meet the new requirements. To mitigate any disruptions to its existing process times, Fujairah is also exploring new target times that will help it to further improve its performance.